The unexpected delay in posting this blog has come to an end, or at least we can hope so. I’m only two sentences into typing this post who knows how long I will hold out. I am having a different kind of Snowbound experience. I have been hit by the AVALANCHE. I wish this experience on no one believe me. Without further delay lets get our Applique on!! 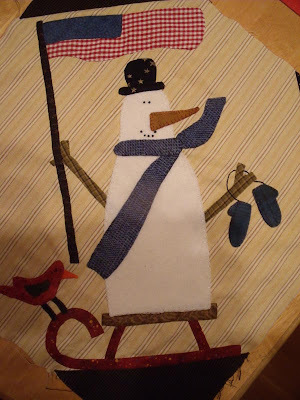 This may be the most important post of theSnowbound Quilt Along because the whole project is mostly applique so we need to cover some ground on this subject. I would start by saying that nuthin blows my skirt up like applique. I love it! Simply love it!!! Not only do I love the look of applique I love the process as well. Many people are allergic to applique, some are my true and wonderful friends. I try not to tell them they are making a mistake, that would be just terribly bossy. 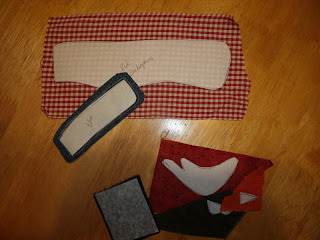 So, when I begin ANY applique project there are two important considerations. First, what is the intended purpose of the project I am choosing to work on? This is an important question because the answer to this question will drive me to consider the technique I will choose for MY construction of the project. In other words. Am I making a tea towel to give to a neighbor with a loaf of pumpkin bread at Christmas? Am I making a bridal quilt for my daughter? Am I making a bridal quilt for the friend of my daughter who I have only met twice? Am I making a baby quilt? Am I making a “Bucket List” quilt that I have wanted to make ever since I first saw the quilt??? Get it? Those are important considerations as I pick my technique. Second, what is my end goal? (Aside from loosing 40 pounds by my doctors appointment on Tuesday!) I mean this.Do I want the applique work to stand out? Do I want the applique work to be subltle? FOR ME...this answer is almost the same. I want the applique to look as close to hand stitched as is humanly possible. So if I am choosing to do machine applique…I repeat...My goal is to make my machine work as close as possible to hand applique as is possible. Third, what materials am I working with? All wool, all cotton, combo stuff. Time for a commercial from our sponsor! If you are reading this tutorial you MUST understand that I am NOT NOT NOT a one method person. 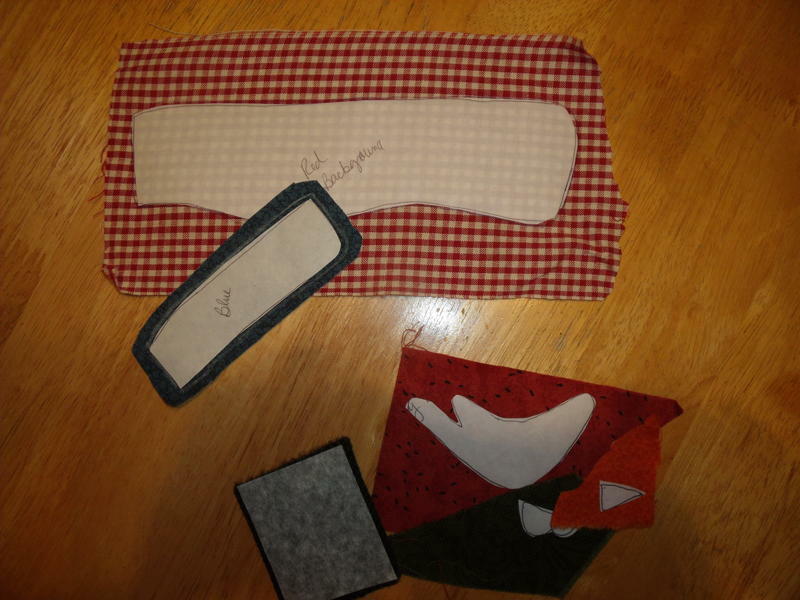 I believe that quilters need a tool box of tricks that they can pick and choose for different purposes and reasons. I am here to encourage you at all times to get out there and try new techniques, products and looks.Let’s learn all the time. Learning = GROWTH ,Ok I’m getting off my soap box now thank you for listening. That felt great. Now you have answered the most important questions and chosen your technique lets sew! Wool Applique. The wonderful world of wool. The beauty of wool is that you DO NOT have to worry about turning or not turning the edges of the project motifs. We just stitck it on the background and begin sewing. yup. Wait a minute it is not quite that easy. First just how are we going to stick it on the background? I like to use a lightweight fusible product and press the motifs to the background. I like for the middle of the fusible to be removed so we do not have the extra stiffness cooked into the fibers of the background and motifs. Again if you were appliquing a monogram to a purse or tote you may WANT that stiffness. 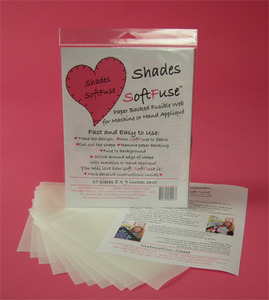 My favorite product is Soft Fuse by Shades Textiles. You can find it here. As a good second place choice my preference is for Heat N Bond Lite. Both products will get you were you need to go. I will from time to time use my handy dandy glue pen. I have one at my finger tips at all times and I buy replacement cartriges by the truck load. Go get one now. This one is by Sewline and sold only in quilt stores. There is another by Fons and Porter. The same pen and they use the same replacement cartriges. Please consider me your personal product tester. You may thank me later. As far as thread for wool applique. What a deep subject that is my friends. I use valdoni floss, dmc floss, Como and many many others. Again, use what you love, and use what you have. I will say that I prefer floss over pearle cotton. Personal preference. I just like the look of it. I love this needle threader. Love love. I can thread the heavier stuff in a jiffy. I just hate spit on the end of the thread going through my needles. hahaha. Do I need to say more? The threader is by Clover. Time to cut out the motifs. This technique for using a fusible product on the back side of the applique is most commonly called “raw edge” applique. You can use it with both wool and cotton. This first and most important thing to remember is that you will need to REVERSE the pattern for this technique, if it has not been reversed for you by the designer. In the case of Snowbound it has NOT BEEN REVERSED. I’ll speak to the designers on your behalf. Trace your motifs on the paper side of the the fusible product. Cut around each motif about a 1/4″ on the outside of the traced line. 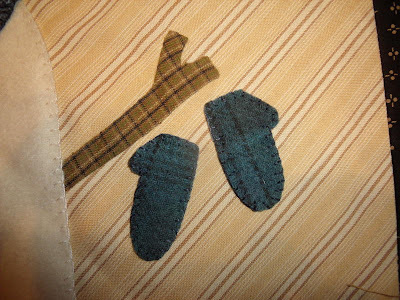 Press the motif shapes to the WRONG SIDE of the fabric. Cut on the drawn line. Voila you are ready to remove the paper and adhear the motif to your background. You can layer the motifs and begin stitching! Brenda is using a “Blanket Stitch” and floss/pearle cotton. She is coordinating her hand work colors to the colors of the wool. This is my preference as well. The hand work is subtle and makes a beautiful quiet little statement! I like to use a “whip stitch”. 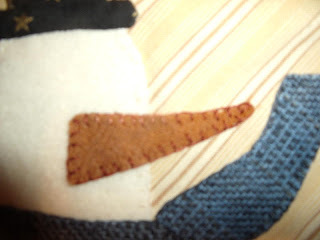 It is very similar to the blanket stitch but less heavy looking. See the edges of the mittens? The difference between the two stitches is that there is no thread running along the wool edge. You can see both stitches best in the photo below. I first learned to use this stitch from Sue Spargo. (I am a big fan of her work). Thanks Sue! How about a touch of sparkle floss! zing. Hand applique Needle turn! or perhaps another way. When doing needle turn I like to trace my motifs onto freezer paper. It is a very good plan to label the motifs. You WILL NOT NEED TO REVERSE if doing by hand. If you plan to make these again and again. You might consider tracing onto template material. I then cut the motifs out. Iron the waxy side of the freezer paper onto the RIGHT SIDE of the cotton fabric. Trace around each shape with…a pencil, a water soluable pen, a heat disappearing ink pen, what ever is your preference. I have them all and use them all at different times. Toys! such fun!!! Remove the freezer paper motifs and cut a scant 1/4″ away from the drawn line. At this point you are ready to place the motifs onto your background. Pin, baste or even use your handy glue pen for this purpose. Sit down fix a cuppa and enjoy stitching. This is a time when I can feel the stress of a busy life leave my body. I am so relaxed and comfortable when I am doing ANY kind of hand work. How about you? Another very deep subject. The raw edge method /fusible method outlined above is a good choice. Follow all those same steps in prepartion for the machine stitching. My preference is to turn under the edges and then machine stitch my motifs by machine using a blanket stitch or a blind hem stitch.I have switched in recent years to the use of .oo4 monfilament thread/polyester, clear and smoke. My favorite BY A LONG SHOT is Harriett Hargraves thread which you can purchase righthere. I don’t have to worry about switching colors of threads out. So this saves tons of time. The reality of this method is that it has most clearly brought me so close to that ultimate goal of making my machine applique look as close to hand work as possible. I have had tons of people say to me..“You did that whole quilt by hand” and watched their mouths fly open when I say “no..it did not.” It was all by machine. You will want to practice with working with monofilament thread but don’t be like me avoid it. I’m sorry it took me so long to come to the table with this issue. (perhaps someone should practice what she preaches!) There is lots to be said here but much too much for this post. I trace my motifs onto freezer paper. No need to reverse! Cut them out and using my handy little glue pen, I dot some glue onto the paper side of the motifs and stick them onto the WRONG side of the fabric. I cut a scant 1/4″ around the motifs. Now for the magic. I use a small iron and press the little seam allowances to the waxy side of the the freezer paper. The wax grabs the suckers and they are beautifully turned under. OH MY!!! Here are a couple shots that clearly show how I use this technique. I know there are no leaves in Snowbound but this is a great photo. I use a stilleto for holding the fabric as I push the little iron. Love my stilletto! love love love. And of course the glue pen helps in those stubborn little spots that don’t want to grab the waxy freezer paper. I beat them into submission. Place my motifs onto the background and I’m off to the races with my sewing. I frequently use the stilletto while at the machine. Thus avoiding sewing my finger into the machine. Ask me how I learned this. YUP x 3. With this kind of precise sewing you have to get a finger or something very close to the needle. You must…trust me here. Didn’t mention that freezer paper in the middle did I? Well! I leave it in! Then when I finish the stitching I make a little slit in the back of the background fabric and swoop in there with my stilletto or just plain jerk it out of there. The paper has been perforated and it pops VERY EASILY OUT!!! SNAP…PERFECTO. I love the way the quilt is not so heavy with fabric layers as well. It feels soooo quilty. OK MY FRIENDS. This post was written in not so great physical conditions on my part. If I have left anything out or you have any questions please email me or better yet comment to the group. Chances are if you don’t understand something someone else feels the same way. Remember I am a career teacher and I love questions and interaction from my group participants. Besides, I’m sick and need a diversion so I can answer your emails. I need a reason to go on!